This hummus dip has everything (literally). 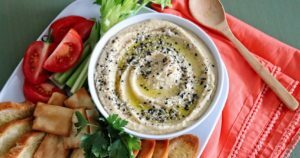 We used the classic everything bagel topping as a flavorful seasoning topping for homemade hummus. Combine hummus ingredients in a food processor, and blend until smooth. Keep refrigerated until ready to serve. In a medium bowl, stir together everything bagel seasonings (except the olive oil) until combined. Spoon hummus into a bowl, drizzle with olive oil, and sprinkle with seasoning before serving. Tip: Serve this dip with bagel chips, pita chips, or fresh vegetables—it’s all good. Don’t forget to snap a photo after you make it and hashtag #SGPartners to get registered to win prizes!